Technology transforms the way students learn and how educators teach. That is why Portsmouth Public Schools embraces new technology, such as BenQ’s interactive flat panels, as a means to strengthen instruction and student achievement. With the school’s inventory of interactive projectors reaching the end of their life, it was time to find a new option that would accomplish that mission. The new technology couldn’t just be another projector; the district wanted a solution that would provide students and faculty with the next generation of interactivity. The district relied on aging, traditional lamp-based projectors as a dedicated whiteboard and interactive surface to boost learning opportunities across all schools and a variety of subjects. However, they required expensive maintenance including costly lamp replacements that took the system out of commission. Additionally, these projectors tend to lose brightness over time, making it difficult for students to see content clearly. Furthermore, the units had to be calibrated, which required more upkeep and increased potential for more system down time. The lengthy boot up and shut down time was another challenge for teachers. They had to plan ahead and keep the class busy and on task while waiting for their projector to warm up before proceeding. Once on, the internal projector fans used to keep the lamps cool were noisy and distracting. Finally, the interactive pens that were necessary to interact with the screen were glitchy, expensive to replace, and limited to one user at a time. With interactive flat panels (IFPs) coming down in price and feature sets becoming more robust, the school district started their research into the latest solutions on the market. Jennifer Thomas, the district’s supervisor of instructional technology, and Schlaepfer attended a nearby technology expo to see products up close. For the better part of the next year, Portsmouth continued their in-depth research process, visiting neighboring districts to get a demonstration of their IFPs and then choosing what solutions to test out. A core group of teachers helped Thomas and Schlaepfer get the pulse of what was happening in the classroom and identify all the ways they wanted to use the screens. “We wanted to find a product that could satisfy a variety of teaching styles and learning needs. For example, we have large and small classrooms as well as those with special lighting needs. We also wanted interactive screens that would accommodate various uses by subject area, thereby providing teachers flexibility with how they use the panels,” said Thomas. BenQ Education RP Series IFPs stood out from the pack. The RP704 70-inch display features 4K UHD resolution that makes every lesson pop off the wall without dimming lights and risking students’ attention, along with 20-point multi-touch capabilities and innovative technologies that provide a healthier viewing experience for teachers and students. Putting the highest priority on keeping users healthy, the screen's tempered glass is covered with a bacteria-resistant coating to help reduce the spread of germs and is enhanced with, TUV certified Low Blue Light and ZeroFlicker backlight technologies to help reduce eye fatigue during long hours of content viewing and instruction as well as anti-glare glass to minimize light reflections and improve readability. Furthermore, they also come equipped with a built-in Android operating system that's packed with a suite of apps and educational games for classroom instruction. They also easily connect to a standalone PC or laptop. 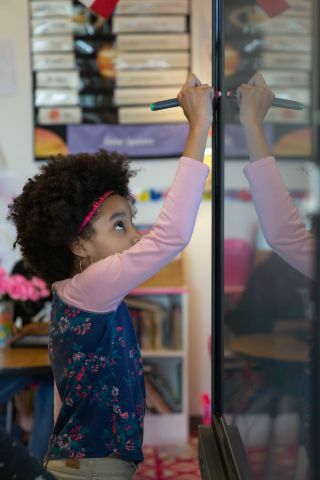 The included pens eliminate internal electronics that are prone to failure while allowing multiple students to work at the screen simultaneously and with different colors. “BenQ had the whole package and a price point that fit our budget,” said Schlaepfer. Working with Troxell, the nation’s leading end-to-end solution provider for education technology, the district installed 675 BenQ IFPs, satisfying all the different use cases and eliminating the expense of lamp replacements. Troxell integrated a Lenovo Tiny onto the back of each screen, providing teachers with a seamless and rich interactive experience that opened additional learning opportunities. Each screen was mounted onto a Peerless cart. For the elementary classrooms and some of the middle school and high school classrooms, the IFPs were mounted onto a cart with a mechanical lift to allow teachers to raise and lower the screen and grant better access to students of all heights. From the instructional side, the BenQ IFP was easy to use. For the first time, teachers were able to turn on the screen and start teaching immediately and without connecting their laptop. Students can work together at the screen simultaneously without a pen and without casting shadows on the screen. Or they can use the included pens for more detailed work. With high brightness that doesn’t fade over time, every lesson is perfectly visible. The panels have also been instrumental for expanding the district’s Google classroom opportunities. The high school art program is using the panels to bring unexpected life to sketches and drawings. Another benefit is being able to more fully accommodate students with visual impairments.